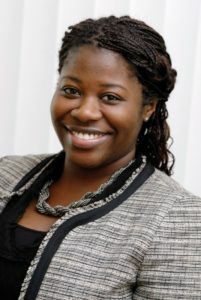 The Robert Wood Johnson Foundation (RWJF), the nation’s leading philanthropy in health and health care, has awarded Nicole M. Overstreet, assistant professor of psychology at Clark University, a 24-month grant through the New Connections program. Overstreet is among a select group of Junior Investigators to receive a New Connections grant. The grant will allow Overstreet to examine nationwide trends in service priorities (medical, housing, community, legal, and victim’s advocate services) and unmet service needs among people experiencing intimate partner violence (IPV), sociocultural factors that prevent access to service needs, and the relation between unmet service needs and poor health outcomes for those who experience partner violence. Overstreet said she hopes study findings will contribute to strategies to effectively improve IPV service access and health outcomes. New Connections is a national program designed to introduce new scholars to RWJF and expand the diversity of perspectives that inform the Foundation’s programming. New Connections seeks early-to mid-career scholars who are historically underrepresented ethnic or racial minorities, first-generation college graduates, or individuals from low-income communities. “We are so excited to welcome Nicole Overstreet into the ninth cohort of New Connections grantees. The program connects first-time grantees to the Foundation, and the new perspectives they bring are essential to solving the critical, complex issues affecting our nation’s health,” says Catherine Malone, DBA, MBA, and Program Officer at RWJF. “This cohort joins the larger New Connections network of more than 850 scholars — a network that provides opportunities for scholarly support and collaboration for academics from underrepresented groups,” says Malone. More information about New Connections is available at http://www.rwjf-newconnections.org. Founded in 1887 in Worcester, Massachusetts, Clark University is a liberal arts-based research university addressing social and human imperatives on a global scale. Nationally renowned as a college that changes lives, Clark is emerging as a transformative force in higher education today. LEEP (Liberal Education and Effective Practice) is Clark’s pioneering model of education that combines a robust liberal arts curriculum with life-changing world and workplace experiences. Clark’s faculty and students work across boundaries to develop solutions to complex challenges in the natural sciences, psychology, geography, management, urban education, Holocaust and genocide studies, environmental studies, and international development and social change. The Clark educational experience embodies the University’s motto: Challenge Convention. Change Our World. For more than 40 years the Robert Wood Johnson Foundation has worked to improve health and health care. We are striving to build a national Culture of Health that will enable all to live longer, healthier lives now and for generations to come. For more information, visit www.rwjf.org.